Former JD/MBA student Ramin Wright. The innovation: Blue J Legal is “kind of like a super-charged Siri for tax law,” says University of Toronto law professor Benjamin Alarie. Like ROSS, Blue J Legal is a program that uses artificial intelligence. It helps determine whether a person is an employee or an independent contractor, a question that has important implications for tax law but also in areas such as labour, contract, and tort matters. The minds: Former JD/MBA student Ramin Wright is assisting U of T law professors Alarie, Anthony Niblett, and Albert Yoon in developing and training Blue J Legal. Potential users: Blue J Legal is not just for lawyers. Once it’s in the market, the developers believe accountants will use it, too. It is not, however, something consumers will turn to at tax filing time. What’s next: Blue J Legal has incorporated and is looking to join a campus accelerator for startups. The team will continue to work at developing it with the goal of launching by the end of 2016. The innovation: When you ask ROSS a legal question using lay language, it will turn billions of documents into snippets of answers in a matter of seconds. Using a percentage, it will tell you how confident it is that it got the answers right, and provide you with the sources for its answers. “Essentially, what you have is a senior partner in a particular area at your fingertips, which is available 24/7 and who’s always ready to answer your question,” says Andrew Arruda, one of the founders of ROSS. 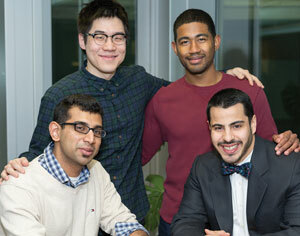 The minds: Arruda, an articling student from the University of Saskatchewan, teamed up with University of Toronto computer science students Shuai Wang, Pargles Dall’Oglio, Jimoh Ovbiagele, and Akash Venkat to participate in a continent-wide innovation competition through the use of Watson, IBM’s artificial intelligence technology. The inspiration: When IBM contacted U of T to enter its students into the competition, the team says it looked at where an application like ROSS would make the biggest impact. Curbing the time for tedious legal research became an obvious choice, they say. Potential users: It’s meant for all legal professionals, including lawyers, junior associates, and paralegals. The creators say ROSS will aid a lawyer instead of being used in lieu of one, but note the technology could replace a team of paralegals with just one paralegal who has access to the app. What’s next: ROSS is currently under private beta testing. The team says it will soon come out with “exciting announcements” with the end goal of getting the application in the hands of legal professionals around the world. The innovation: StandIn Law has been called the Uber of legal services. When a lawyer or paralegal can’t attend court for brief appearances, such as adjournment requests, the app will allow them to get in touch with other counsel near the courthouse who are free to show up on their behalf. The stand-in lawyer stipulates their fee, and when they’re paid, they’ll be charged a service fee of $7.50 through the app. 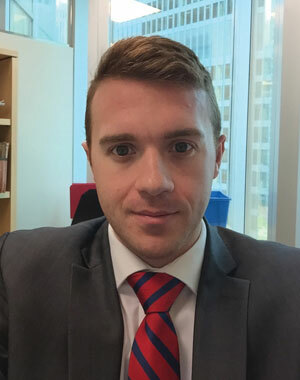 The minds: Andrew Johnston, LLM student at Osgoode Hall Law School, created the app while a law student at Michigan State University. Johnston has now teamed up with lawyer Peter Carayiannis at Conduit Law to further develop the app and take it to the market. The inspiration: “I found that a lot of solo and small [firm] lawyers have basically two issues: issues revolving around time and travel on a daily basis,” says Johnston. These lawyers need to maximize their time and cut down travel time, he adds. Potential users: It would be solo and small practitioners who are pressed for time and have limited resources. Paralegals have also shown a lot of interest, Johnston says. What’s next: The app launched in July. It’s available in Toronto and Detroit, and there are plans in the works to expand to New York, San Francisco, Los Angeles, and Chicago. The innovation: The web-based program would use crowd funding to retain a lawyer for people with important human rights or Charter-related claims. Claimants would also be connected to a host of professionals, including other lawyers, who would offer their expertise in exchange for continuing professional development credits. The minds: Joshua D’Cunha, S.M. Karim, Zoma Ogbonna, and Malik Suliman, part of the first batch of students at Ryerson University’s Law Practice Program, pitched this idea and came out No. 1 in a Dragons’ Den-like competition to address access to justice issues through innovation. 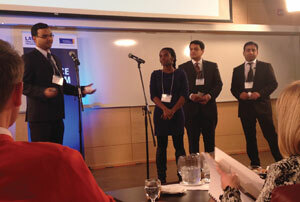 The winning team has discussed their idea with Ontario Chief Justice George Strathy. The inspiration: The idea revamps the now-defunct Charter Challenges Program, which provided financial assistance for important court cases. Only a small remnant of that program now remains after cuts by the federal government. Potential users: If it comes to fruition, the initiative would be open to people with human rights claims, such as discrimination based on race, religion, age, and disability. The innovators also hope it would be a platform for poverty law, refugee claims, and other claims under section 15 of the Charter. What’s next? “We have spoken to Chris Bentley, director of the Law Practice Program, about partnering with Ryerson University’s new Legal Innovation Zone to execute the program. The next step would be to conduct a feasibility study before launching a pilot version of the program,” D’Cunha says.